How to Setup Facebook Instant Articles on WordPress? The users spend more time on websites that tend to load faster as the topics they want to read or look load more quickly. It is as simple as that. A faster loading website increases the probability of the user to navigate to other pages. The things get worse if you are running an e-commerce site. No matter how good the products are on your website, if the site runs at a snail’s pace, the user will not return. This will seriously affect the ROI or Return on Investment of the business. However, it is more than just about speed. In this day and age, you need not just rely on Google to get visitors. There is another powerful platform – Social Media. It can be an incredible tool to get a considerable amount of traffic flowing through your website. This is the reason you should focus on making the content highly shareable in you want to stay on the race. Besides creating great contents, speed and shareability are also the driving factors that determine how well your website will do. This is where Facebook Instant Articles come in. This is a feature launched in 2015 to make the pages load faster for Facebook users. Facebook Instant Articles may provide you with more likes, comments, and shares; which mean a better chance for your content to get to more eyes. 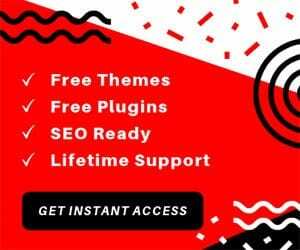 Instant Article is a feature that makes your content load faster with the help of a customized mobile format and hosting the contents on Facebook itself. This means faster loading content that doesn’t require sending users to any external sites. The pages are loaded right inside the Facebook app. The lack of redirection already sounds faster; pair that with a customized mobile format and you’ll get a site that loads ten times faster than average. Apart from being just fast, Instant Articles also provides an optimized reading experience. You can focus on reading without having to worry about distracting menus and sidebars. So you get faster web contents that are more likely to be read and shared and less likely to be abandoned midway, what more to want, right? Here is how you can set up Facebook Instant Articles on WordPress. How to Create Facebook Instant Articles on WordPress? Instant Articles was designed to make it easy to create from the existing content. You don’t need any additional software or learn a lot to figure out the tool. The HTML and RSS of the articles will be parsed by Facebook to convert them into Instant Articles. You can also insert media and other features using specific tags. 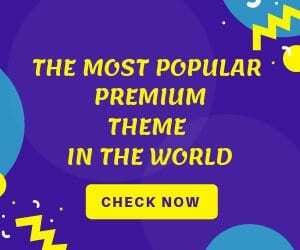 Keep in mind that some WordPress shortcodes and content types may not be automatically translated and you may need to create rules for these types of content to make them export successfully. This will require some experimentation and patience. Head over to Plugins -> Add New and then search for “Instant Articles“. 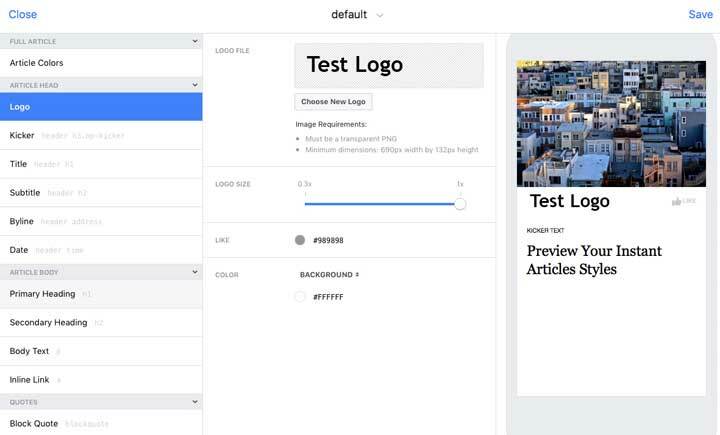 Make sure you install the official plugin by Automattic, Dekode and Facebook. After the plugin is done installing, activate it. 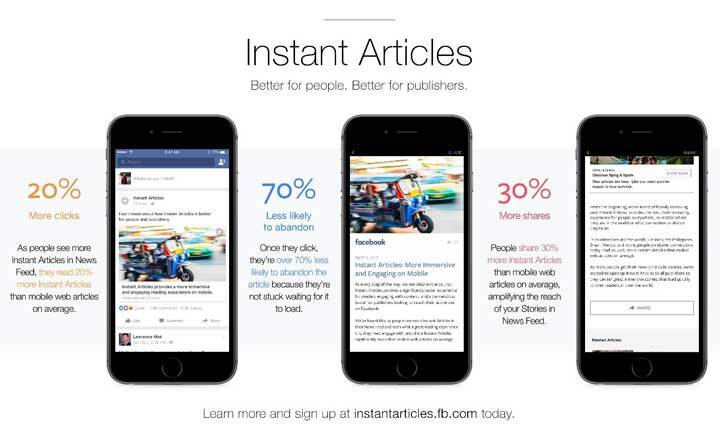 Now, you’ll need to head over to Facebook and Sign up as Instant Articles creator. You can leave the WordPress site open. Before you sign up as an Instant Articles creator, you need to have a Facebook Page that you are an administrator of. If you intend to monetize the contents, refer to Facebook Content Guidelines. You need to have an “established presence“, meaning that you have to post regularly and have a good follower count. Step 1: Go to instantarticles.fb.com and click on Sign Up. Step 2: Select the page you want to use Instant Articles for. 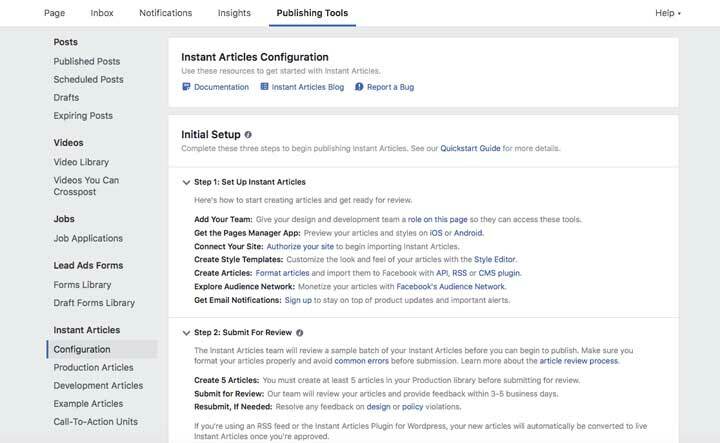 Step 3: You’ll get to Instant Articles “Publishing Tools” page. Step 4: Click on the link “Authorize your site” to authorize your site to import Instant Articles. Step 5: You get a code that looks like random numbers. Copy this code and go back to WordPress. Step 5a: Inside Instant Articles Settings page, paste the copied Page ID inside the text box beside “Facebook Page ID“. Save the changes. Step 6: Head back to the Facebook’s Publishing Tools page and enter your website’s URL under “URL“. Click on “Claim URL” button and wait a few minutes. You’ll be notified when the URL has been successfully claimed. 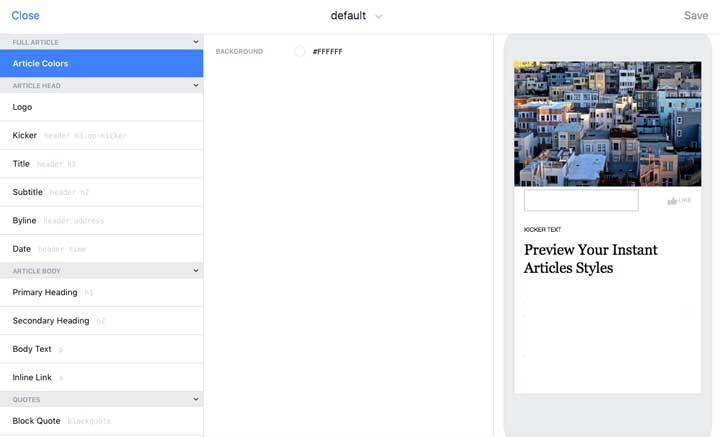 Step 7: When installing Instant Articles plugin, an Instant Articles feed will be created for your site that’ll look like example.com/feed/instant-articles. Add /feed/instant-articles/ after your site’s URL. Copy the complete URL and paste it into the Facebook’s settings page inside Production RSS feed section. Save the changes. Step 8: You’ll need to at least have five articles in the Production Library to submit for review. Any new articles will be automatically imported, and the existing articles can be imported by going through each of them and clicking the update button. You can check the import progress by clicking on Production Articles from the Facebook’s menu. 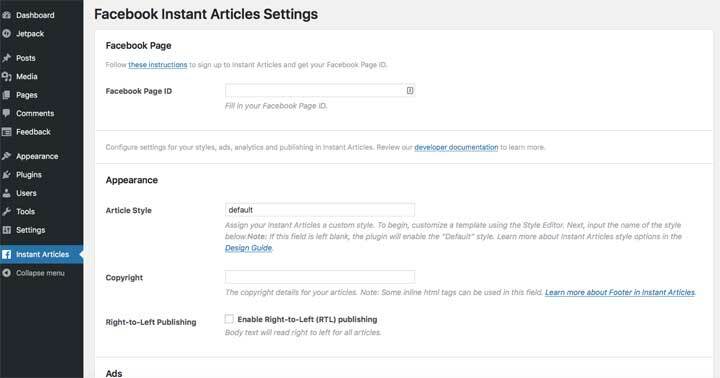 Step 9: Go to Instant Articles Configuration on Facebook and look for Styles. Click on “default” to edit the style. You’ll get to an editor where you can make changes and see how the content will look inside the Facebook app. Step 10: You cannot submit Instant Articles without a logo. The logo needs to be a transparent PNG and of size 690 x 132 pixels. This logo will be displayed under the feature image. You’ll be able to see how the article will look in the preview. Step 11: After the styling has been done, save it and close the editor. Step 12: Head over to the Configuration page on Facebook and Click on “Submit for Review“. Facebook will provide feedback after 3-5 days after they finish reviewing the article. 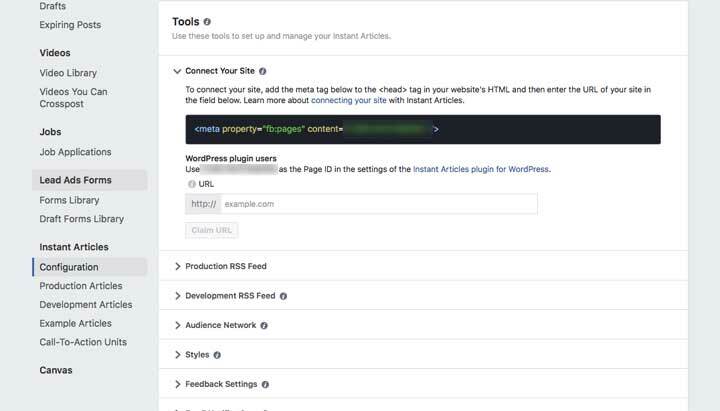 After they’ve been approved, you can start publishing Instant Articles on your Facebook page. If you’re an aspiring blogger or produce any other type of content that will work well with Instant Articles, this feature can be fun to work with. The steps are easy to understand, and you’ll start publishing Instant Articles in no time. The plugin will automatically convert your content, so you don’t have to do any extra work.